Janowicz was born and raised in Elyria, Ohio as son of Polish immigrants. He went to Holy Cross Elementary School and graduated from Elyria High School. The stretch of Seventh Street which runs along the south side of Elyria High is named Vic Janowicz Drive in his honor, and the school's official address is 311 Vic Janowicz Drive. In addition, a life-size painting of Janowicz hangs in the lobby of the school. Janowicz played college football at Ohio State University. A tailback in the single wing, he won the Heisman Trophy in 1950 as a junior. 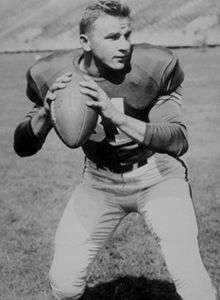 Woody Hayes, who coached Janowicz's senior year, said of him, "He was not only a great runner, but also passed, was a placekicker and punter, played safety on defense and was an outstanding blocker. Janowicz epitomized the 'triple-threat' football player." After college, Janowicz passed up offers to play professional football in order to pursue a baseball career. He reached the major leagues with the Pittsburgh Pirates, but hit only .214 over two seasons as a bench player. He returned to football late in the 1954 season with the Washington Redskins, and was their starting halfback in 1955. During training camp in 1956, he suffered a serious brain injury in an automobile accident that left him partially paralyzed and ended his athletic career. Janowicz eventually made a full recovery and became a broadcaster of Buckeye football games. Later he worked as an account executive at a Columbus manufacturing firm and, from 1986, as an administrative assistant to the state auditor. He died in Columbus, Ohio, of cancer in 1996.